Alaskan malamute is one of the oldest Arctic sled dogs. Breed's origin is at the Alaska, where Mahlemiut-tribe used their dogs to pull heavy loads, like their seal hunt trips. Alaskan malamute is heavy weight puller, who don't compete with it's speed like siberian huskies. Extremely demanding conditions made dog, who is extremely strong, is weather proof, uses well it's food and is intelligent, extremely persistent and never gives up. Malamute wasn't a one man's dog, anyone in the village could use them to work and that's why they should be kind to all people. 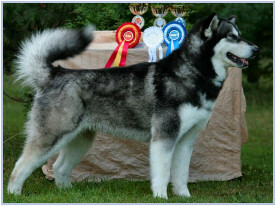 Malamutes today are from two different lines; M’Loot- and Kotzebue-dogs. Biggest difference between the lines is size. M’Loot-malamutes are much bigger than Kotzebuet. 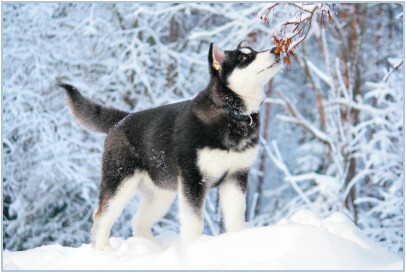 Also coat coloring are different: Kotzebue-dogs were wolf gray and M’Loot-malamutes were black-white or white. Alaskan malamute is one of those breeds, which standard hasn't been changed much during the years. Breed standard has been made in year 1935. Alaskan malamute is quite near it's origin even today, and to be able to understand it's temperament, it's important to know what qualities were important in it's original environment. Malamute shouldn't ever be fearful or aggressive. It should be kind, open, strong minded and confident working dog. Malamute is intelligent but also very independent in a same time. Malamute is very pack oriented and it demands much attention. Malamute is very curious and it wants to participate to all with it's owner..
Alaskan malamute thinks of it's own and can be sometimes very stubborn and it's training can be challenging. Good basic training is still very much needed, because they usually try their limits every now and then. Generally speaking, malamutes are very fast learners, in good and bad things. Malamutes are bored quite easily and when they do, they will start to disobey - and some people think that it's stupid. Malamutes training is best to do with positive reinforcement and by using it's natural greediness. You should never use hard or physical training with sanctions. Alaskan malamute is friendly and usually wants to greet all people. That's why it isn't a guard dog and you should not even teach it to do it. Learning to guard things and with malamutes intelligence, it can take a lead and make it's own decicions. Because it's friendly temperament, malamute is usually a good family dog, but because it's strength and size, it usually isn't walked by children. You also should remember, that you should never leave child and malamute unattended, just to avoid accindents. Malamutes are quite hierarchy oriented and they can imagine their place over the children if they are let to do so..
Alaskan malamute owner should get to know pack behaviour, dog's sign language and pack hierarchy. Malamutes are very vivid dogs and reading their signs is quite easy, if you are familiar to dogs sign language. You can even tell their ear position, what they are thinking. Malamute owner should be consistent, fair, firm and to be able to control the malamute. Because of his size and strength, malamute is almost impossible to control physically. Owner should have mental control with malamute. Respect has to be earned and when it is mutual, malamute is the most perfect companion. You should also train nail clipping, brushing and other treatments starting from their puppy time and make clear, that those are operations, which are done anyway. Malamutes shouldn't be challenging their owners directly, but they can do it secretly and you can notice it after they already are boss in the house. 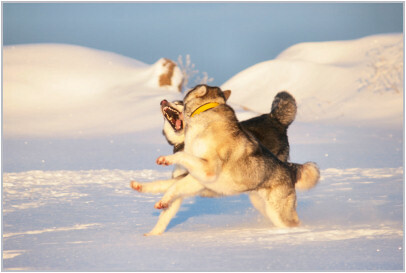 Malamute has preserved their primitive instincts during the years and that's why they usually are not "dog park" dogs. Early socialization is still very important and getting to know different breeds is recommended to done already in puppy time. Usually this brings you a confident malamute, who don't make unnecesary noise of itself. Young malamute can come along well with other dogs, but when it mature, it can change. Malamute with good temperament isn't provoking, but it can answer provokation very fast. You should always keep in mind that. Alaskan malamute is very energetic dog, who needs much to do. If it can't use it's energy to allowed things, it is very good to experience and create something fun. Usually owner doesn't think these are good ideas. Malamute usually don't tire down in a leash walks and pulling, sledding, carting, biking and all those kind of things are good to malamute. 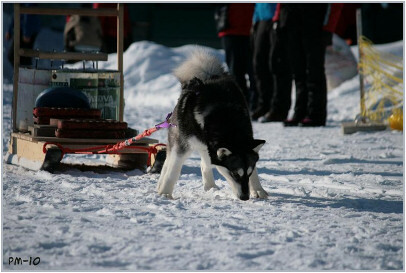 You can start training pulling with one malamute with skis, bike or kick sled. Malamute can also pull pulka or carry doggy pack in hikes. 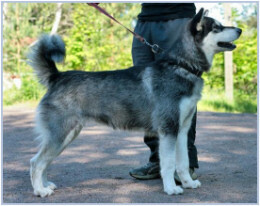 Also weight pulling is suitable for a healthy malamutes over 2 years old and it's typical for this breed. Malamute can also be used in obedience or agility, but you should always remember it's origin and take good sense of humor with training. Malamute is very fast and swift for it's size. Alaskan malamutes has quite strong prey instinct, depending of individual and that can lead to a running away if they smell interesting tracks. Also smaller house pets, like cats and rabbits can be prey to them. Malamute can be taught to live with other house pets, like any other breed, if they are trained already as a puppy. Most malamutes love to dig and usually you don't need to teach them to do it. Flower beds and other plantings can be gone and look like they have been in bombing after malamute. This is why you should make good ground to malamute's yard fence, so they don't dig their way out of it. Malamutes are quite silent dogs, if you talk about barking. But they really make all other noice, from gentle woo-woo to heart breaking howl. Malamutes have a lot of opinions and they usually want to tell them out loud. Many times people, who don't know malamutes, is easily thinking that they are aggressive, because they bend their ears against the scull and are making odd sounds, but they usually are just so happy to meet new people. Malamutes have strong and thick coat, which blows up two times a year. You cannot believe the amount of hair, when you see it shedding off. Malamute should be brushed often when they are shedding. Malamute without coat is totally different than in winter coat. Because of it's dense coat, they can easily have hot-spot, suppurative skin infection if they get wet in summer. Malamute should be dried carefully after swimming or washing. You should never take wet malamute to it's yard fence in winter, before it's totally dry. Alaskan malamute likes to be outside and many of them are living in yard fence through the year. But you never should take malamute because you can put it yard fence and forget it there. They need so much companion that it would be wrong towards them. Yard fence should be placed in place, where they can see all the action in yard and it is easy to pay attention to malamute. Malamute should have rain shed and dog hous, where it can find shelter against bad weather. Usually they don't need heating to their dog houses. Despite of malamute's weather proof, it needs to get inside in case of sickness. You should never take malamute just because of it's appearance, or because it's cute as a puppy or if you need just pet dog. Malamute isn't necessarily suitable for a first dog, because it's easy to make mistakes but correcting them is much harder. When you are interested Alaskan malamute as a breed, you should find out as much information you can get. It's recommended to meet malamute owners and their dogs, go to dog shows, races and other happenings to meet many malamutes and talk with their owners. It's also good to meet few reputable breeders to find the right breeder for you. Reputable breeder knows breed well, uses only healthy dogs in breeding and can also give instructions in different situtations. Breeder should also be honest about breed's special features, because malamute isn't just a pet, guard dog or easy every man's dog. They usually don't have much will to please.